Animation of Eadweard Muybridges Sallie Gardner at a Gallop, photographed June 19, 1878, at Palo Alto, California. 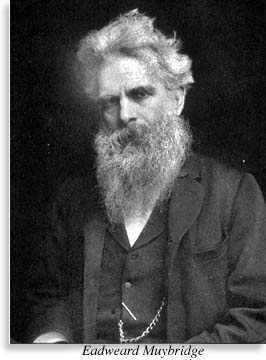 Muybridge (1830-1904) had been commissioned by Gov. Leland Stanford to demonstrate that, indeed, trotting horses did lift four feet from the ground at the same time. Photographic series such this were shown on a Zoopraxiscope, a primitive motion picture developed by Muybridge. See: the Chronophotographical Projections site for some remarkable Muybridge animations.